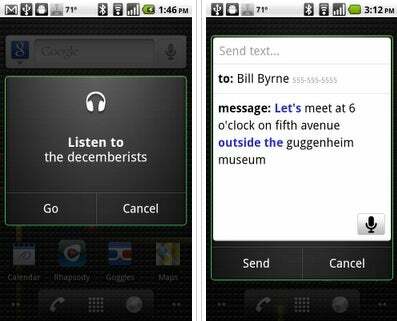 Google introduced two new features for Android phones running Froyo. First, there's a load of new voice commands, activated by tapping the microphone button in the software search widget or holding the hardware search button. Notably, users can dictate an entire e-mail, leave a "note to self" (Norm Macdonald should be pleased) or call a business by name without looking up the number first. The "listen to" command brings up a list of Web apps, such as Last.fm and Pandora, but it doesn't appear to work with your on-board music library. Google Voice Actions lets you speak commands to your Android phone. To get these features, you'll have to update the Voice Search app, the Google Search widget and any music apps you plan to use. Want to compare these voice commands to those of other phones? Check out these cheat sheets for iPhone and Blackberry. Send links, maps, and more to your Android handset from Google's Chrome browser with Chrome to Phone. The second feature is "Chrome to Phone," which as the name suggests, pushes links, maps and phone numbers from Google's Web browser. Users must install the Chrome to Phone browser extension and corresponding Android Market app. Prefer Firefox? Check out the third-party "Send to Phone" add-on that works in Mozilla's browser. The blogosphere seemed to have higher expectations for Google's announcements. Speculation included a dedicated video calling application -- an odd choice, given that only one Android phone to date, HTC's EVO 4G, has a front-facing camera -- a remote geolocation feature similar to "Find My iPhone" and the long-awaited debut of Google Music. Friday's announcements were low-key compared to those prospects, but there's nothing wrong with a little more basic functionality, either.